Every part of India have their own style of flat breads with their authentic touch. I was eagerly waiting to try this besan ki masala rotis for this month's Indian Cooking Challenge choosed by Srivalli and finally prepared them last week for our dinner. Thanks to Valli for proposing this super interesting,flavourful and very delicious masala roti with gram flour and wheat flour for this month challenge eventhough i wanted to try the bajra aloo roti she choosed along with this masala roti. Valli choosed this fantastic besan ki masala roti from the famous Indian chef Sanjeev kapoor's space, obviously i know that this rotis will definitely tastes fabulous and its gonna be our favourite. I wasnt wrong, i prepared almost 6 rotis and they vanished super quickly, since this roti goes for a simple masala filling they dont even need any side dish to enjoy with. We simply loved these rotis. Combine all the spice powders given under the list 'masala filling' in a bowl with the ghee and salt as a paste. Now take the gram flour,wheat flour,salt and ghee in a bowl, with enough water knead everything as a soft and stiff dough, keep aside for half an hour. Divide the dough as eight portions and make a balls, roll them as a disc, spread the already prepared masala over the rolled disc. Fold into half and then again in half to make a triangle. Roll out gently as a triangular roti, finish the remaining balls. Heat a tawa, drop gently the roti,drizzle the ghee and cook on both side until they turns golden brown. Apply little ghee and press it gently between your plams, serve immediately. Flavorful rotis,Priya.. I haven't tried with besan yet,lovely!! Wow love those triangle Priya..agreed the taste was outstanding, never realised besan alone would taste so well! 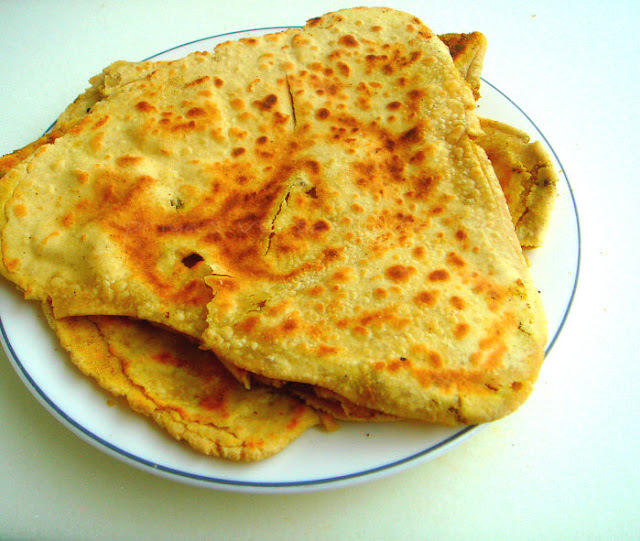 the triangular parathas are a win away..on the table..i like them a little spicy..love these. I agree with you Priya. They were very flavourful. The rotis look absolutely inviting.. I loved besan roti too Priya more than the bajra aloo roti (I guess because it carries the healthy tag;). Looks awesome Priya. Yummy, I saw this on Sanjeev Kapoor's recipes but haven't tried so far. Looks delicious. This looks incredibly flavorful, I am bookmarking this recipe and can't wait to try it!